Cloud IaaS platform's native networking products are one of the fundamental components that enable customers to isolate cloud infrastructure, scale application requests handling capacity, and connect physical network to the private virtual network. This section gives a high level view of networking products. Virtual Private Cloud (VPC) is a private network established in Alibaba Cloud. VPCs are logically isolated from other virtual networks in Alibaba Cloud. VPC is a private network dedicated to you in Alibaba Cloud. 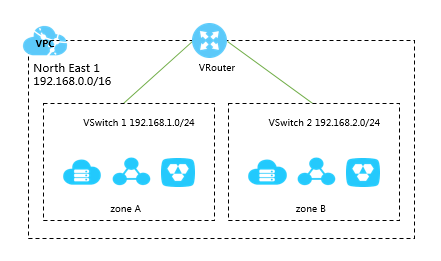 You have full control over your VPC, such as specifying its IP address range, and configuring route tables and network gateways. You can also use Alibaba Cloud resources such as ECS, RDS, and SLB in your own VPC. We won't dive into much detail of its architecture here, but you can refer to this documentation on Alibaba Cloud's VPC design. Alibaba Cloud Server Load Balancer is built to cope with high volume traffic and each year in November is put to the test during Alibaba’s annual Global Shopping Festival. Alibaba relies on Server Load Balancer to provide uninterrupted service during the festival by switching requests between data centers and transferring transactions to the most available server. This includes transferring requests to servers located over 1,000 kilometers away, without missing a single transaction. A managed load balancer can, literally, automatically distribute incoming application traffic across multiple server instances in the cloud. It enables our application to achieve greater levels of fault tolerance, seamlessly providing the required amount of load balancing capacity needed to distribute application traffic. We won't dive into much detail of SLB here, but you can refer to this documentation on Alibaba Cloud's SLB documentation. Express connect provides a fast, stable, secure and private or dedicated network communication between different cloud environments, including VPC intranet intercommunication and dedicated leased line connection across regions and users. View official Express Connect documentation here. Alibaba Cloud DNS (Domain Name System) is an authoritative highly available and highly scalable domain name resolution and management service. View official Cloud DNS documentation here. Alibaba Cloud CDN is a Content Delivery Network (a.k.a CDN). Alibaba Cloud CDN has 1,200+ nodes distributed across the globe, it enables users to effectively reduce website response time to milliseconds, ensure smooth video streaming and handle large volumes of traffic. Cloud IaaS platform's native compute service provides resizable cloud-based compute capacity in the form of virtual servers. It allows us to provision one or thousands of instances simultaneously, and pay only for what we use, making web-scale cloud computing easy. This section gives a high level view of compute products. We won't dive into much detail of its features here, but you can refer to this documentation on Alibaba Cloud ECS features. Auto Scaling is a service to automatically adjust computing resources based on your volume of user requests. When demand for computing resources increase, Auto Scaling automatically adds ECS instances to serve additional user requests, or alternatively removes instances in the case of decreased user requests. Auto Scaling is the very basic feature that every public cloud provides. It usually works together with Load Balancer, but it's not a requirement. Alibaba Auto Scaling not only provides the elastic scaling ability to ECS servers for your web workloads, but it also supports RDS database scaling. The service is free or charge and you only pay for your ECS instances in your auto scaling group. We won't dive into much detail of its features here, but you can refer to Alibaba Cloud Auto Scaling getting started guide. Alibaba Container Service is a container (currently only Docker) management service that provides containerized application lifecycle management. It can be integrated with Server Load Balancer, VPC, and other Alibaba Cloud services. 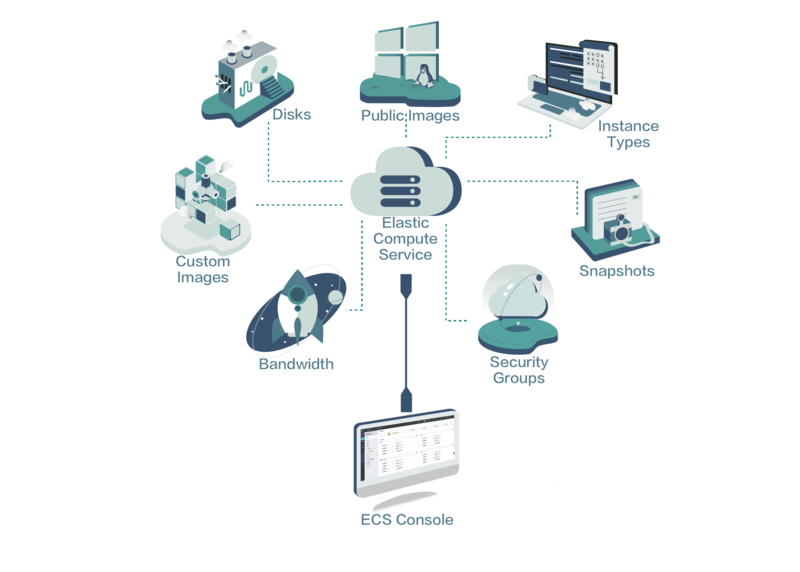 Elastic GPU Service (EGS) is a powerful GPU-based computing service suited for high-demand computing, including video decoding, graphics rendering, deep learning, and scientific computation. The service boosts fast speed, strong concurrent computing, and floating point computing capabilities.